DBusiness magazine occupies a unique niche in the metropolitan Detroit media landscape. 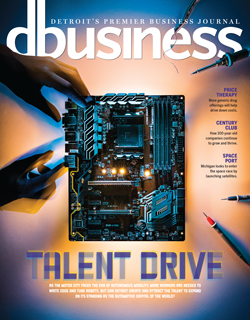 DBusiness is the only independently published, general-interest business magazine in the region … and no other business publication has DBusiness‘s glossy, high-quality, full-color magazine format. DBusiness fills the need for thoughtful, engaging, in-depth content that is a “must read” for business executives who are looking for useful information and ideas to help them unlock their potential, manage and grow their business, and stay on top of regional business issues and trends. Please select your advertising destination from the menu on the right.